This website (www.ehaat.org) is served by Essex and Herts Air Ambulance. 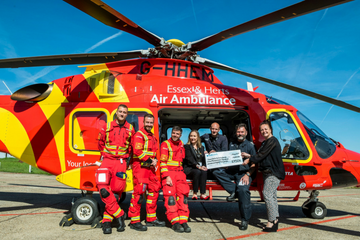 The privacy of our supporters is very important to us and the Essex & Herts Air Ambulance takes the protection of your information seriously. The Charity is committed to ensuring that it complies with the eight principles of good practice within the Data Protection Act 2018. We only obtain personal information with your consent and will only use this data in a fair and lawful way to further the objects of the Charity. Our lawful basis for processing your personal data is to provide you with information about the Charity, to advise you of our fundraising activities and where requested, details of our lottery. We will always store your personal details securely. We’ll use them to provide you with the service that you have requested and communicate with you in the way(s) that you have agreed to. Your data may also be used for analysis purposes, to help us to provide the best service possible. We will only allow your information to be used by suppliers working on our behalf and we’ll only share it if required to do so by law. Cookies are small files saved to the user’s computer’s hard drive that track, save and store information about the user’s interactions and usage of the website. This allows the website, through its server to provide the user’s with a tailored experience within the website. Users contacting this website and/or its owners do so at their own discretion and provide any such personal details requested at their own risk. Your personal information is kept private and stored securely until it is no longer required as detailed in the Data Protection Act 1998. Every effort has been made to ensure a safe and secure form to email submission process but we advise users using such form to email processes that they do so at their own risk. This website and EHAAT use any information submitted to provide you with further information about the products/services we offer or to assist you in answering any questions or queries you may have submitted. This includes using your details to subscribe you to any email newsletter program the website operates but only if this was made clear to you and your express permission was granted when submitting any form to email process. Or whereby you, the supporter, have previously purchased from or enquired about purchasing from the company a product or service that the email newsletter relates to. This is by no means an entire list of your user rights in regard to receiving email marketing material. Your details are not passed on to any third parties for their own use. This website operates an email newsletter program, used to inform subscribers about products and services supplied by the website. Users can subscribe through an online automated process should they wish to do so but do so at their own discretion. Some subscriptions may be manually processed through prior written agreement with the user. Subscriptions are taken in compliance with UK Spam Laws detailed in the Privacy and Electronic Communications Regulations 2003. All personal details relating to subscriptions are held securely and in accordance with the Data Protection Act 1998 and any subsequent legislation. No personal details are passed on to third parties for their own use or shared with organisations or persons outside of EHAAT who operate this website. Under the Data Protection Act 1998 you may request a copy of personal information held about you by this website’s email newsletter program. If you would like a copy of the information held on you please write to the business address at the bottom of this policy. Email marketing campaigns published by this website may contain tracking facilities within the actual email. Subscriber activity is tracked and stored in a database for future analysis and evaluation. Such tracked activity may include; the opening of emails, forwarding of emails, the clicking of links within the email content, times, dates and frequency of activity [this is by no means a comprehensive list]. This information is used to refine future email campaigns and supply you with more relevant content based around your activity. Although this website aspires to include only quality, safe and relevant external links, users are advised to adopt a policy of caution before clicking any external web links mentioned throughout the website. (External links are clickable text / banner / image links to other websites). EHAAT cannot guarantee or verify the contents of any externally linked website despite our best efforts. Users should therefore note they click on external links at their own risk and we cannot be held liable for any damages or implications caused by visiting any external links mentioned. Communication, engagement and actions taken through external social media platforms that this website participate in are custom to the terms and conditions as well as the privacy policies held with each social media platform respectively. Users are advised to use social media platforms wisely and communicate/engage upon them with due care and caution in regard to their own privacy and personal details. This website will never ask for personal or sensitive information through social media platforms and encourage users wishing to discuss sensitive details to contact them through primary communication channels such as by telephone or email. This website, through EHAAT’s social media platform accounts, may share web links to relevant web pages. By default some social media platforms shorten lengthy urls [web addresses] (for example bitly.com, tinyurl.com). Users are advised to use caution and good judgement before clicking any shortened urls published on social media platforms by this website. Despite the best efforts to ensure only genuine urls are published many social media platforms are prone to spam and hacking and therefore we cannot be held liable for any damages or implications caused by visiting any shortened links.